A robot waiter delivers meals for customers at robot-themed restaurant. More and more work activities and even entire jobs are at risk of being automated by algorithms, computers and robots, raising concerns that more and more humans will be put out of work. The fear of automation is widespread — President Obama cited it as the No. 1 reason Americans feel anxious about the economy in his State of the Union address last month — but its effects are not equally distributed, creating challenges for workers and policymakers. An analysis of where jobs are most likely to face automation shows that areas that voted Republican in the last presidential election are more at risk, suggesting that automation could become a partisan issue. So-called “routine” jobs — those that “can be accomplished by following explicit rules” — are most at risk of automation. These include both “manual” routine occupations, such as metalworkers and truck drivers, and “cognitive” routine occupations, such as cashiers and customer service reps.1 Whereas many routine jobs tend to be middle-wage, non-routine jobs include both higher-wage managerial and professional occupations and lower-wage service jobs. The metro where routine work accounts for the largest share of jobs is Riverside-San Bernardino in California (the “Inland Empire” east of Los Angeles). Southern metros account for four of the top six. 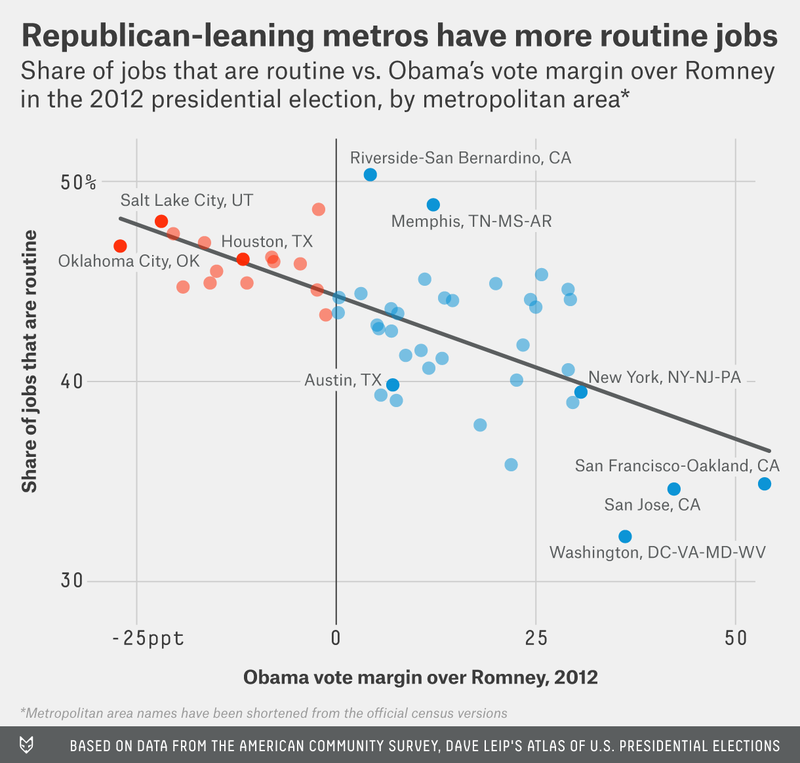 Eight of the 10 metros with the highest routine-job share favored Mitt Romney in 2012; Riverside-San Bernardino and Memphis, Tennessee, were the only exceptions. Note the absence of Midwestern manufacturing centers such as Detroit, Cleveland and Milwaukee from this list. With the decline of American manufacturing employment, “production” occupations now account for a small share even of routine jobs. Routine jobs are more likely to be behind a desk than on the factory floor. None of this data suggests that routine jobs make people vote Republican, or that red-leaning metros attract routine jobs or repel non-routine ones. But the simple correlation alone — without any causality — suggests that automation may turn out to be a partisan issue. Red metros have a higher share of routine jobs, and their economies are therefore more at risk from automation. Blue America is not only at lower risk from automation, but stands to reap more of its benefits because tech hubs — where the developers of the algorithms and robots are — lean strongly blue. No single factor, such as the risk from automation, will determine a metro area’s economic fate. Other factors matter too. For instance, high housing costs hold back job growth, and housing affordability is a bigger challenge in blue metros than in red metros. Furthermore, the pace of automation and its net impact on jobs is uncertain, and many local markets will adapt: The economies of cities such as Seattle and, more recently, Pittsburgh have been reshaped as the U.S. economy has evolved from manufacturing to services. And automation — like other technological innovations — creates new jobs while making other jobs obsolete. Ultimately, the net effect of automation on employment is still up for debate. But whether automation, on balance, ends up being a net creator or destroyer of jobs, people whose jobs are automated away face difficult transitions and uncertain prospects. Those difficulties and uncertainties will be felt more in areas that currently lean Republican. A standard definition of routine jobs includes production, operations, sales and clerical occupations; non-routine jobs include professional, managerial and service occupations. Data on the share of routine jobs, for the U.S. overall and for individual metropolitan areas, comes from the 2000 decennial census (Table QT-P27) and the 2014 American Community Survey (Table B24010). Farming-related occupations were excluded. Data on 2012 presidential vote for metropolitan areas was calculated from county election results as published in Dave Leip’s Atlas of U.S. Presidential Elections. Small metros with low routine-job shares tend to be college towns, such as Ann Arbor, Michigan; Boulder, Colorado; and Durham-Chapel Hill, North Carolina. The correlation between routine-job share and population is -0.37; the correlation between routine-job share and median income is -0.79; and the correlation between routine-job share and the Gini coefficient of household income inequality is -0.24. These correlations are for the 207 metros that were large enough for the census to report occupational data in the 2014 American Community Survey. These correlations were weighted by metro population and are statistically significant. The relationship between routine-job share and vote margin is statistically significant even after controlling for median household income, which is itself strongly correlated with voting for Obama in 2012. Data on job growth and wage growth comes from the Bureau of Labor Statistics Quarterly Census of Employment and Wages. The data shown is the annualized growth rate from the second quarter of 2009 through the second quarter of 2015. Wage growth is adjusted for inflation. County unemployment data is not seasonally adjusted and therefore differs from the headline national rate, which is seasonally adjusted.